Learn to build and streamline processes to increase organizational efficiency through marketing operations management. Learn to identify areas where processes can be improved, then put them into effect to make organizations run more quickly and economically. You’ll direct change using the in-demand operations management techniques necessary in today’s workforce. As you progress through the four-year program, you’ll focus on the principles and methods used to plan, manage, and improve the quality of organizations. In the online B.B.A. in Operations Management program, you’ll learn the fundamentals of business through our general bachelor of business administration curriculum. In addition, you’ll take courses specific to operations management to complement your core business classes. Best of all, you’ll still graduate in the same amount of time as with a general BBA. Our top priority is to provide you with the help you need to excel inside – and outside – the classroom. Take advantage of our free resources like tutoring, academic coaching and our writing center to propel you through college, and into a successful career. 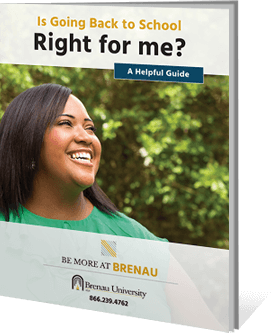 Learn how you can customize your degree at Brenau. Work-life balance is becoming increasingly important to many business professionals. For Jenny, finding the right school-life balance was just as important. By earning her graduate business degree online from Brenau, she was able to make time each day for her full-time job, her family and her education.